Always keeping an eye on the sky beyond the Red Planet, the Mars Society is pleased to announce that Jeffrey Volosin, Project Manager of NASA Goddard Space Flight Center’s Transiting Exoplanet Survey Satellite (TESS), will provide the upcoming 21st Annual International Mars Society Convention with a full update on the new mission to search for exoplanets. Launched last month, the TESS spacecraft is expected to monitor more than 200,000 stars for temporary drops in brightness caused by planetary transits, with the hope of locating thousands of new exoplanets in orbit around some of the brightest stars in the sky. This first-ever space-borne all-sky transit survey will identify planets ranging from Earth-sized to gas giants, around a wide range of stellar types. Mr. Volosin has held a variety of positions over the past 27 years primarily in government work related to space exploration. He served as NASA’s Deputy Division Chief for Space Communications and also supported Earth and Space Science robotic spacecraft development and operations at NASA Goddard and the National Oceanic & Atmospheric Agency. In addition, he spent nearly 10 years involved in human spaceflight, working as a system engineer and life support engineer, studying future human mission to the Moon and Mars. 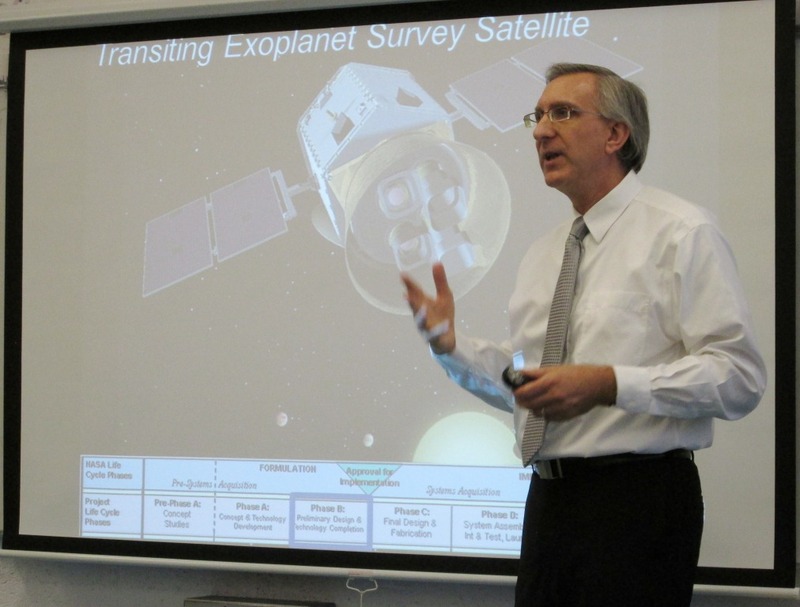 Mr. Volosin graduated from the Florida Institute of Technology in 1986 with a Space Science degree. For the past 10 years, he has also served as an Adjunct Professor in the Astronautical Engineering Department of Capitol Technology University, teaching Graduate and Undergraduate courses in Systems Engineering and Spacecraft Design.